Auckland Intl. - McCarran Intl. 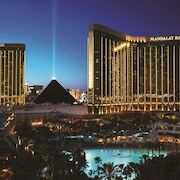 Put on your dancing shoes and get ready to roll the dice as we take you to Sin City. 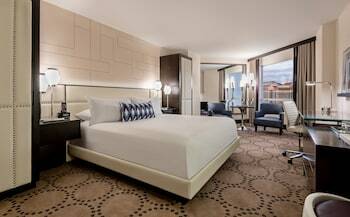 Las Vegas holidays are perfect for a getaway to the extraordinary, so get ready to try the exquisite cuisine and indulge in its bustling nightlife. Lift your champagne glass and make a toast to a trip you won't ever forget, because you’re going to Vegas! 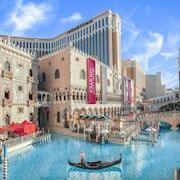 After booking one of our Las Vegas packages, it's time to figure out your itinerary. 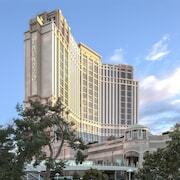 Begin the day with a relaxing stroll down The Strip and take in the sights and sounds of the city. Explore the history of the city’s bright lights at the Neon Museum, or, if you want to stay off your feet, you can enjoy a relaxing gondola ride offered at the Venetian. When you're ready for some real excitement, take advantage of a Las Vegas car hire, and drive to one of the area's skydiving sites. Vegas offers both indoor and outdoor skydiving, so you can choose your dose of adrenaline. Prefer to stay on the ground? Hit up The Mob Museum and learn about Vegas’ connection to gangsters. You'll see exhibits on Al Capone and Bugsy Siegel, and G-Men like J. Edgar Hoover, who helped bring down some of America's most notorious mobsters. After you've had your fill of fedoras and cigars, wind down and visit the Burlesque Hall of Fame. If you find yourself captivated by the satin and fishnet, book tickets to watch a live dance show at one of the casinos. 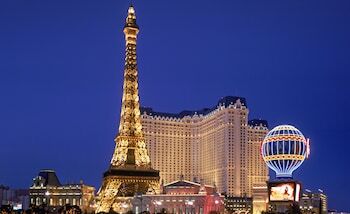 If you want to go shopping, Vegas offers everything from high-end boutiques to small tourist shops. 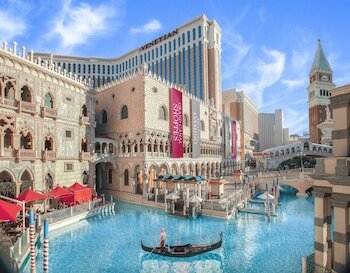 For designer threads, head to the Forum Shops at Caesars Palace or the Grand Canal Shoppes in the Venetian Hotel. Buy yourself an outfit you’ll be proud to take selfies in and wear it out for a night on the town. Ready for some extra-fine dining? Treat yourself to a perfectly cooked steak paired with delicious wine at one of the many five-star restaurants on South Las Vegas Boulevard. Some of the best chefs in the world have made Vegas their home, so eat up. After your meal, it's time to let loose. Follow the bright lights to one of the many casinos lining The Strip, and try your hand at a round of poker or blackjack. You could just get lucky! After cashing in your chips, follow the music to the infamous Vegas nightclubs. 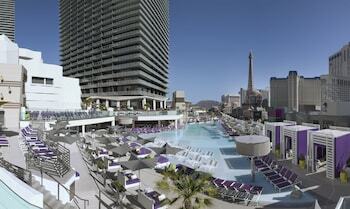 You'll find everything from world-class DJs and celebrity sightings to ice bars and acrobats. 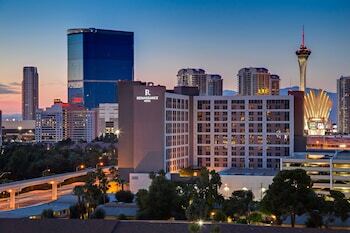 Whether you're seeking a hotel in the heart of Las Vegas, or a more laid-back environment in the city's outskirts, you can count on Wotif to make it happen. Relax and let us do all the work for you. 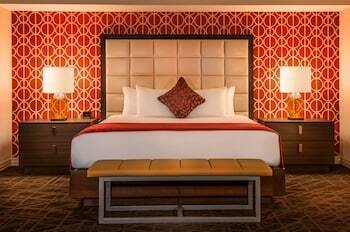 With The Strip vacation package, we have you covered. We can find quality accommodation to suit your every need. The only thing you need to worry about is how to balance all the fun-filled activities available during your stay. 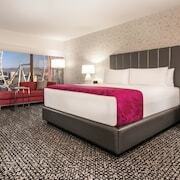 Holidays to Las Vegas are waiting—book your trip today! One of the most famous hotels in Vegas, home to gorgeous botanical gardens, a unique glass sculpture and an elaborate nightly fountain show. In Vegas, anything is possible, including a trip into the deep for an encounter with some of the most exotic and dangerous marine creatures in the world. 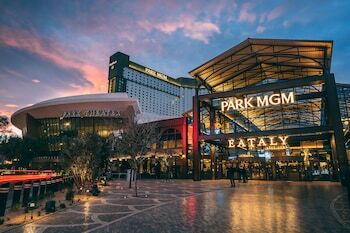 Go back to Las Vegas’s roots on legendary Fremont Street, now a pedestrian-only area with free nightly shows and special events. 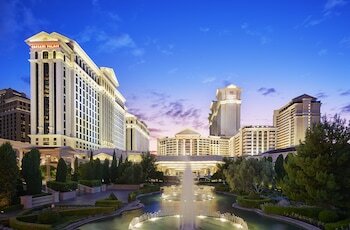 Shop amidst golden statues at the Caesars Palace hotel and casino—the epitome of opulent retail. Put your hands in the air and scream if you want to go faster at this indoor theme park. 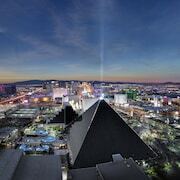 Have a go on the thrilling rides at the top of Las Vegas’s tallest structure, or just enjoy the stunning views. View animals housed in authentic habitats at this small zoo with a big mission to teach visitors about protecting the homes of endangered species. People always talk about wanting to escape to Paradise, but did you realise you actually can? Paradise, Nevada, is a real place, and it’s just as magical as it sounds. 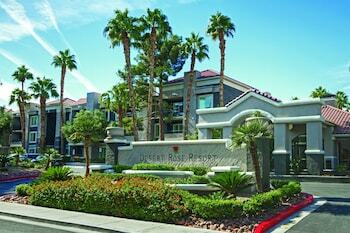 It's got the glitz of the downtown Vegas Strip and the beauty of the mountains, with perfect weather year-round. Discover all the fun for yourself when you book your next trip there. Great hotel. Convenient parking. Well organised car park. Excellent room. Heaps of space in the room with big beds. Lots of lifts the to the room. Room was very clean and well set out. 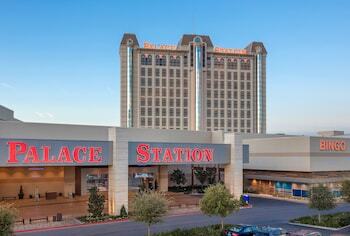 I would suggest Excalibur Casino Hotel to couples and families. The hotel itself was incredible, I highly recommend if you want something unique. However, the room does not have tea or coffee making facilities or even a fridge. Nice hotel, great restaurants lovely staff, but unfortunately it smells of cigarette smoke. So for non smokers it's rather off putting. Hotel is in a Great location and has some beautiful shops. The wifi was slow and constantly require reconnecting & we weren’t able to get a king bed non smoking so had two queens. However the Room was a great size with a ok view of some of the strip.